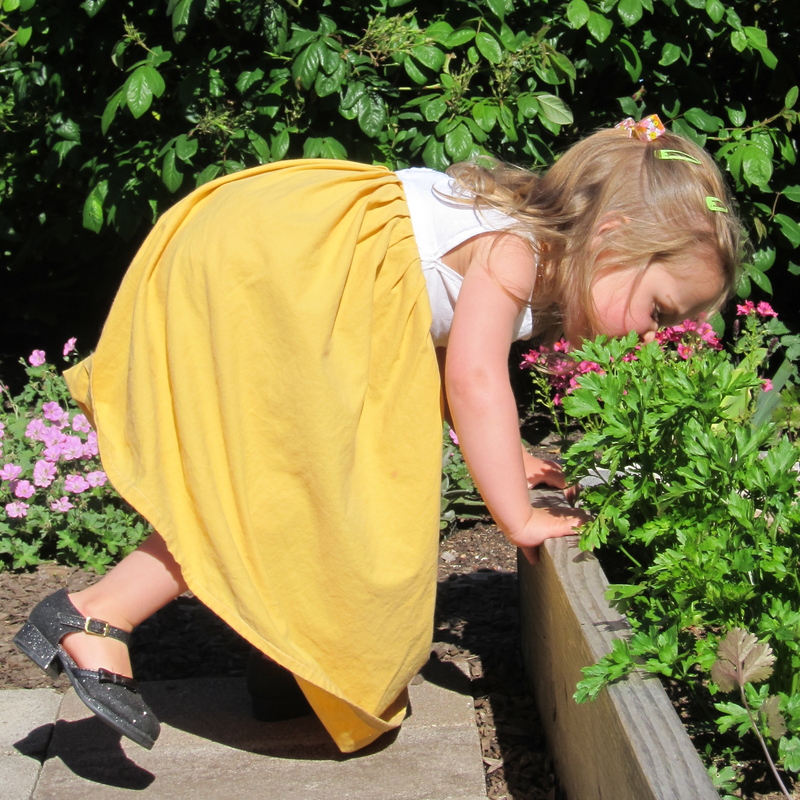 Ahhh, the sweet smell of compost!….. Yes, actually. A healthy compost pile should never smell bad, but should have a nice earthy smell- and when it does, I and many of my garden zealot friends can often be found running our fingers through the finely aged compost. (I’m not kidding!) Anyway, eccentricities aside, a compost pile can be not only a recycling facility for your kitchen and your garden waste, but also a highly efficient processing plant- ran by earth worms and other critters- that produces a first rate soil improver- compost. No garden should be without it! If the contents of your pile tends to be wet and smelly, mix in more browns; if they are dry, mix in more greens. If you’re interested in more info on composting and/or help in creating a composting system for your garden, contact me here, or at carla.lazzarini@gmail.com. I don’t mind at all getting my hands dirty! More and more people are growing their own food these days (how quaint ;-)) and some of us are getting a bit serious about it. Planting fruit trees or hedgerows of berries is taking it to the next level, in my opinion. That’s not to say that growing seasonal veggies like greens, squash, tomatoes, etc. isn’t a big commitment, because it is, but when you plant food-producing trees and bushes, they start to take up some space! 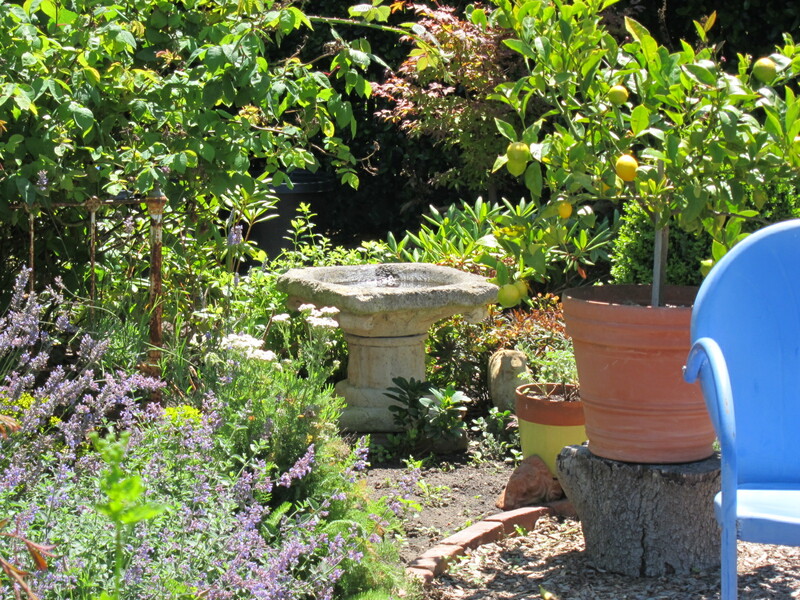 Granted, once they’re planted there is less overall labor involved, as compared to a vegetable garden, but most of us just don’t have the space sitting around waiting to be turned into an orchard. So now we’re talking real commitment and dedication. 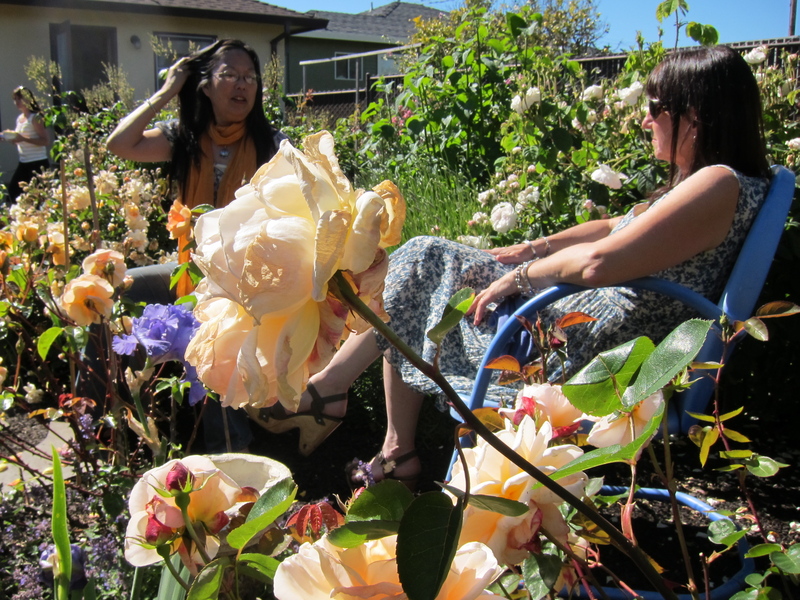 What part of your existing garden are you going to rip out?? If you’ve got to the point where you’re ready to make space, you really want to make sure that you plant the right varieties so they’ll actually produce fruit here on the coast. 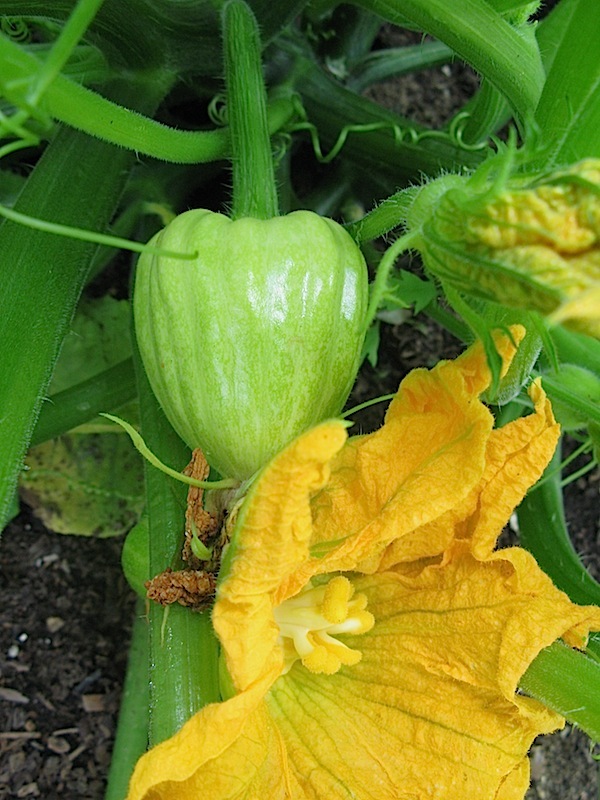 First, find out if the variety you want is self-pollinating (1 plant will do) or if it needs cross-pollination (you’ll need at least 2 different varieties). Also, many types and varieties of fruit need a certain minimum number of chill hours (temp. between 32 & 45 deg.) in the winter and a sustained period of warm weather in the summer that we just don’t get in our temperate coastal climate. You can find out these requirements from either the tag at the nursery or from the catalog you’re ordering from. Here’s an important bit of info that you’ll need: we get an average of 500 or less “chill hours” here on the San Mateo County coast, so it’s usually safe to plant something that requires 400 hours or less and is early ripening (again, catalog will indicate). 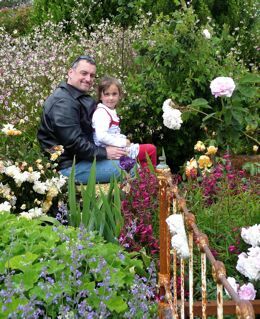 Every late May/early June I have a garden party to share with my friends and family the abundance of blooms in my garden. It’s so floriferous at that time of year that if would be just plain selfish of me not to share! I recently came across some pictures from last year’s bash- where we served the best mint juleps ever!- and thought I would belatedly share with y’all. in the midst of clouds of Nicotiana mutabilis and Penstemon ‘Garnet’ (among others!). If they sit still enough, a hummingbird is bound to come by! bordered by peppermint scented geranium (Pelargonium tomentosa), already-bloomed Bearded Iris and Nepeta fasanii ‘Six Hills Giant’. and relax in the garden! Parsley Gone to Seed -for the beneficials! 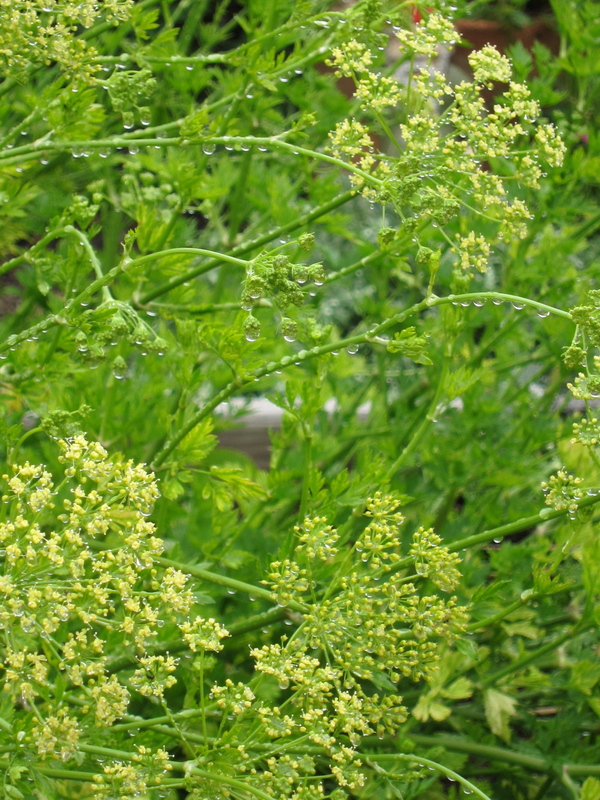 I let my Italian parsley plant go to seed because I wanted to attract beneficial insects to my other veggie plants. You probably hear the term ‘beneficial insects’ a lot. I know I do, but what the heck are beneficial insects?? Well, the two benefits that “good” bugs can bring to the garden are either eating other bugs that are considered pests or being pollinators. So predators and pollinators are what we want in our bug population. These types of insects are attracted to certain types of flowers and some of their very favorites are the flowers of herbs and greens from your food garden that have gone to seed. So it’s not always a bad thing to let your cilantro or lettuce bolt, as long as you know that it’s no longer tasty as food for you (bitter! ), but now is serving another purpose- contributing to the health of your garden! 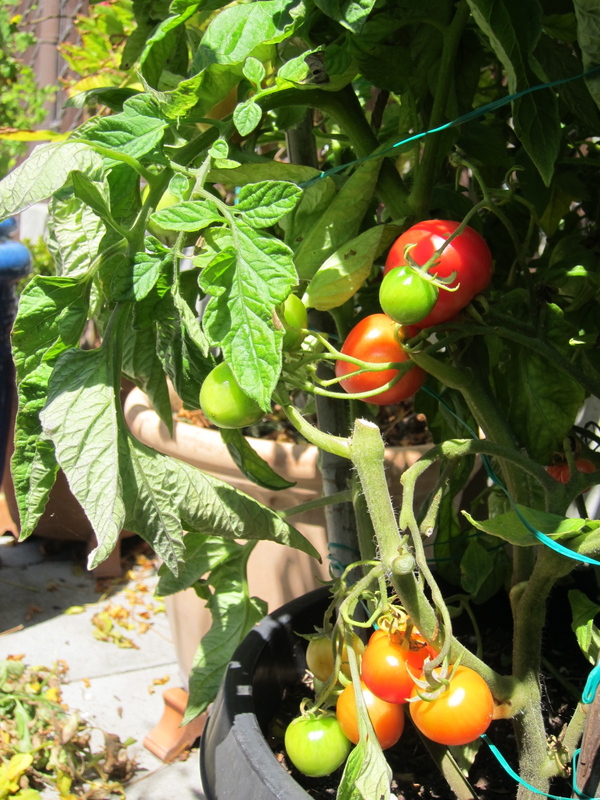 For the first time, I have successfully grown tomatoes (besides cherry tomatoes) in my garden in Half Moon Bay! They’re not in a hot house and we didn’t even have much sun this summer. (to say the least!) I just put them in the warmest, most protected part of the garden, fed them with compost and fish emulsion and watered them a lot. I planted three plants- Juliette F1 (60days), Oregon Spring (58days) and Stupice Early Tomato (52days)- in a black, plastic 15gal pot and placed it against a south-facing fence next to my compost bin. Voila! I trim things back if they’re in the way (of me or other plants), I keep up with my watering & weeding and I continue to harvest the food we’re growing. Aside from that, I also do a lot of thinking about what to do next- what changes I want to make in the layout of my garden for next year, what plants will need replacing, which ones I want to plant more of or try for the first time, etc. Mostly what I do, though, is wait for the sun to appear so I can go out and enjoy it! As garden seasons go, it’s one of the more relaxing ones.